Before I talk about the dish, I want to describe a bit of my cooking practice. I do usua follow a recipe, though I'm never overly careful about exact measurements or worry about whether I have all the ingredients. Sometimes this is a good thing, as I create my own flavors. But as you might guess, this method could produce inconsistent results. And though I was a chemistry major (my graduate degree in theoretical chemistry), I could never be an analytical chemistry whose precision and accuracy are well known. It's a chicken dish and because I have other chicken recipes I love, I decided to go with beef. Typically, I use skirt steak but other cuts of beef are fine too, just make sure it's sliced thin. What I love about this dish is all the fresh ingredients. And it's a perfect summer dish because the only thing warm is the beef. 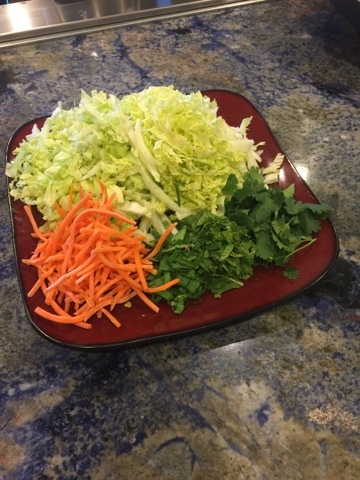 I usually use savoy or Chinese cabbage, shredded carrots, fresh basil, mint, and cilantro. I would love to add bean sprouts but I just can find any. I know some people will add rice noodles or mung beans noodles, but since we are doing a low carb diet, I use roasted spaghetti squash. For me, the key ingredients for this dish are basil and mint. I love this flavor combination and now I add them to my salads too. 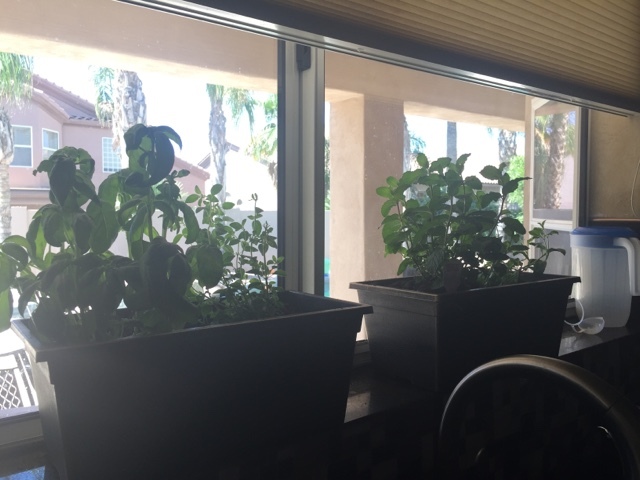 As a side note, I am now attempting to grow my own basil and mint. The planters sit on my window ledge by the sink so they do have some chance of surviving my brownest thumb. Wish me luck! 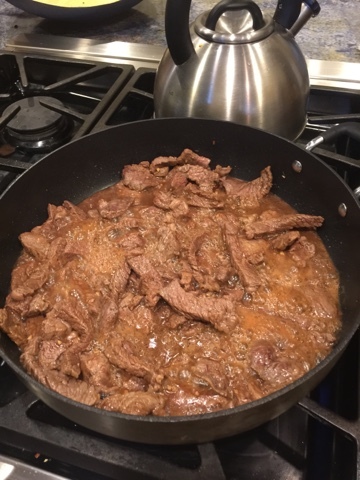 For the beef, I add the classic Asian sauce (soy sauce or Tamari sauce, garlic, ginger, rice vinegar) while cooking. To this I add a bit of lemongrass (fresh, when I can find it, otherwise dried) and a packet of stevia. If I weren't on a low carb diet, I would add honey or sugar. Because the sauce contains no sugar, it won't get that nice glaze when the sauce is reduced. But you can thicken the sauce as it cooks, just be careful not to dry it. Now it's time to assemble. Shredded cabbage first, noodles or spaghetti squash next followed by carrots, basil and mint. 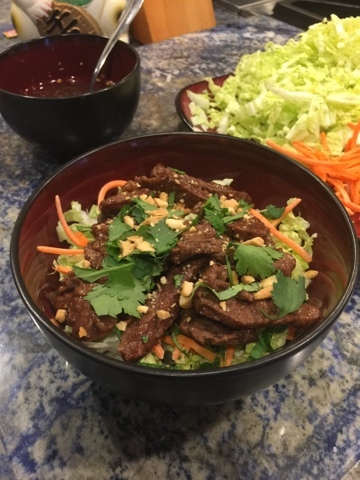 I add the beef on top and sprinkle with crushed peanuts and cilantro. 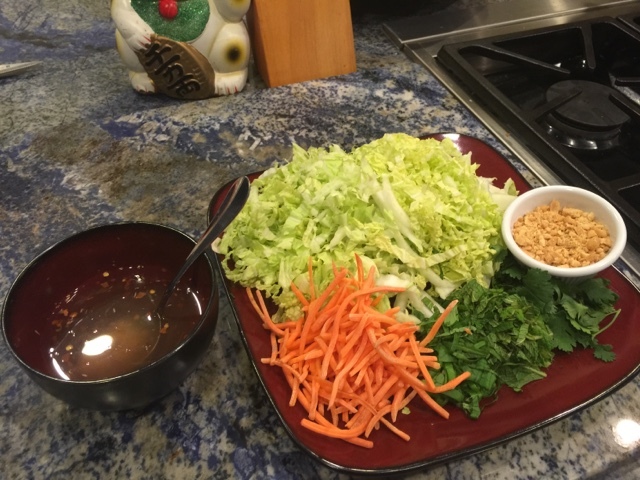 I make a Nuoc Cham sauce that is in the linked recipe. I hope you'll give this a try, I think you'll enjoy it! Combine all the ingredients except for the beef and oil. If you use a cheap cut of meat, you can marinate the meat ahead. 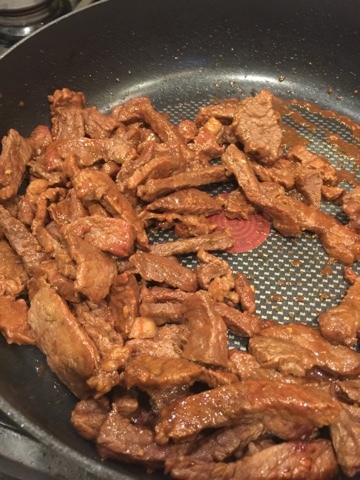 I think the rice vinegar helps to tenderize the beef. Heat a pan medium high and add your oil. Once the pan starts to smoke a bit, add the beef. Brown the beef (about 5 minutes). Add the sauce. I usually let the sauce reduce so that it just wets the beef. Once the beef is cooked, you can assemble your bowl. Add the sauce and enjoy!! Let me know if you try this! What's your favorite summer recipe! This looks really delicious, Angelcake, especially since all I've had to eat this morning is yogurt and coffee. You lost me with the basil and cilantro though. I don't like the taste of either, although cilantro works okay in salsa. I suppose I can experiment on my own though. I gotta go get something to eat! Yeah, I got distracted and burned my chorizo! Luckily I hadn't gotten to the part where I added the eggs, so there's that :) Ended up with taquitos and guacamole, yummers! Going camping tomorrow afternoon until Sunday so I can relax while Mufu does the cooking. He likes to go all out with chicken and steak. I would settle for hot dogs and burgers, but we make it work. Give your hubby a big hug from me wilya? One for yourself too. I know what you guys are dealing with, having been through it twice ourselves. Take care, Ms Kari.